Over the next few months, I want to "arrange and write up" an accumulation of about 1000 covers and cards. Yes, that's the scale of the backlog.... I don't exhibit at National or International shows which means that I am free to do what I want. 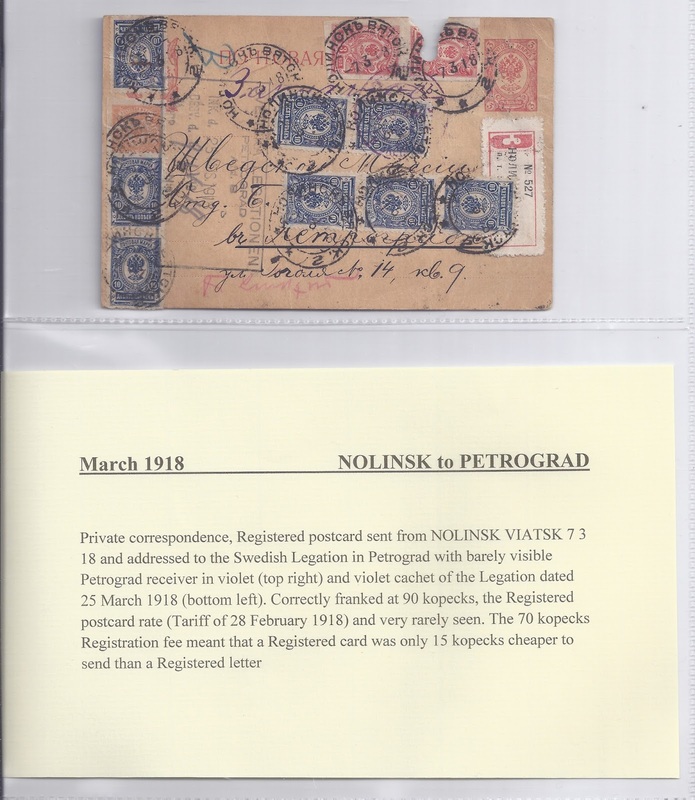 I sometimes exhibit to collector societies (my national one is the British Society of Russian Philately) and I want a system which will allow things to be picked up and turned over and which has an Easy to Read write up. I have settled for the "Cosmic" display system and specifically sheets divided into two pockets. The top pocket is large enough to take most covers and cards. For an outsize item I can use a single pocket page. 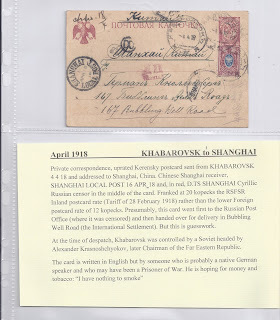 Since none of my material is shiny white FDC stuff, I wanted to avoid white paper for my write up which would just make my postal history look grubby. (It is grubby but let's not emphasise that). I wanted to use grey paper but that has to be ordered each time - you can't just pick it up at your nearest copier paper shop. So I am using cream as a second choice. The write up is done in grey brown rather than black (which from a computer printer is too stark) and I use larger font sizes, 18 for headings and 14 for text. 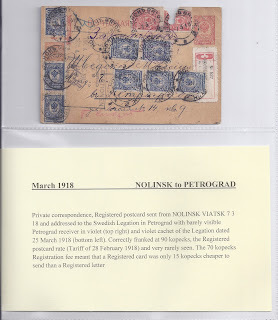 I try to vary the text and not to spend time on the Obvious - so I don't in general describe the stamps (which anyone can just see ..) unless they have some notable feature. I think my biggest problem is to maintain consistency in the write-ups. I can and do save the templates with the underlined header, but I doubt I will maintain consistency in transliteration. I just know that sometimes I will write VYATKA and the next time VIATKA. 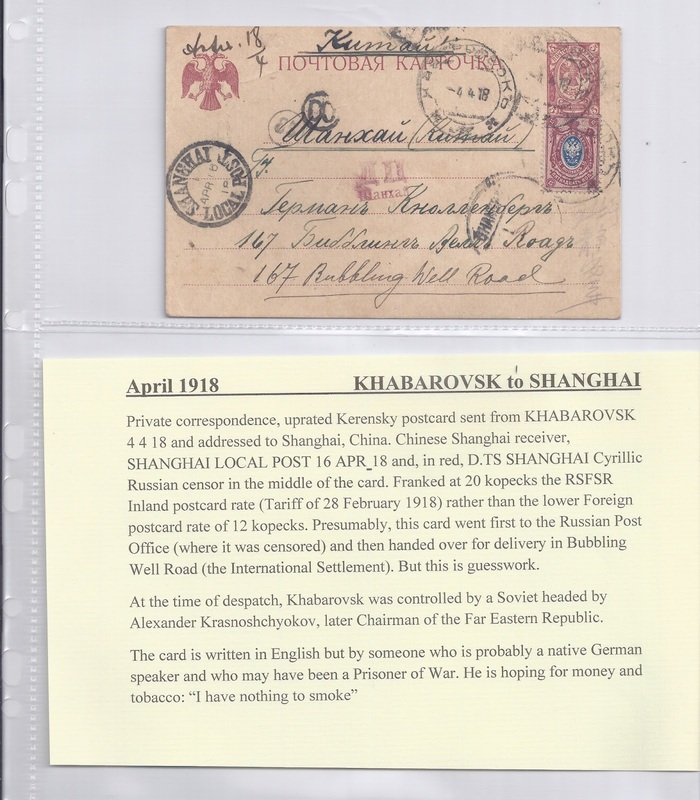 Some of you will have spotted where my title came from: as a boy, I read a book "How to Arrange and Write-Up a Stamp Collection" by Phillips and Rang and now freely available on Amazon. This method makes perfect sense to me, particularly since you have chosen not to subject yourself to the very narrow rules of exhibiting.